Jennifer Lopez showed a lot of leg at the ceremony last night, wearing a high slit Donna Karan gown that matched the red carpet up to camouflage. The dress is part of the Fall 2014 collection and it was right up J.Lo’s alley, with a deep V cleavage and sheer skirt that showed her undies. J.Lo was accompanied by Casper Smart, who wore a plaid suit. Jennifer performed “First Love” and “We Are One (Ola Ola)” later on stage, and received the Icon Award. Iggy Azalea showed that she can be a lady, wearing a stunning Zahair Murad gown from the Pre-Fall 2014 line. The rapper went for burgundy and lace, with long sleeves and a high neck, but plenty of skin shown through. She was accompanied by boyfriend Nick Young, and she performed “Fancy” on stage, as well as presenting an award with Ricky Martin. But not all of the performers of the evening were… alive. Michael Jackson‘s hologram was also present, performing “Slave to the Rhythm”, which is part of a posthumous album released by Sony Music. The performance got mixed reviews, being life-like but creepy at the same time. Kesha looked more glam than ever in a strapless black gown with a mermaid bottom and big back bow. The singer wore her pink hair in a loose hairdo, which made her look like a rebel princess. 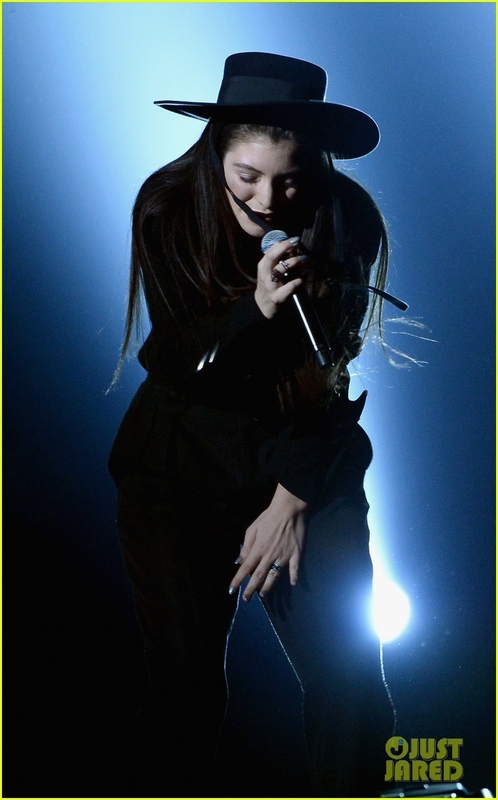 Lorde took the stage in an all black ensemble, to perform her new hit, “Tennis Court.” The 18 year old singer was introduced by Nicki Minaj, and won the award for Top New Artist and Top Rock Song for “Royals”. Another talked-about performance was Robin Thick‘s, who went on stage in the hope of getting his wife back. The artist and Paula Patton recently broke-up, but he’s not yet given up: “All right, you got to help me try to get her back now,” he announced, before performing “Get Her Back”. The big winner of the evening was Justin Timberlake, who went home with awards for Artist of the Year, Top Male Artist, Billboard Music Award for Top Billboard 200 Artist, Top Radio Songs Artist and Top R&B Artist. Imagine Dragons also got quite a number of awards, including Top Duo/Group, Top Hot 100 Artist and Top Rock Artist. Katy Perry won Top Female Artist and Top Digital Songs Artist.